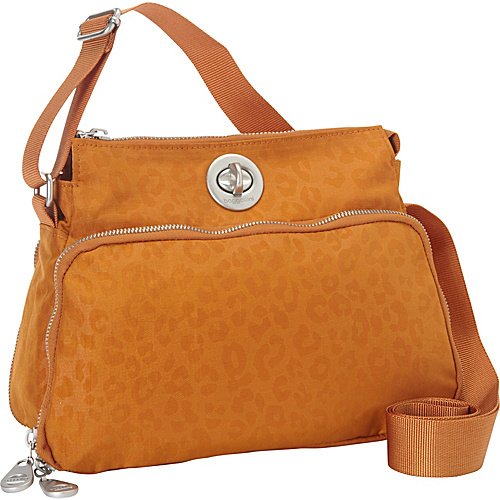 Carry your everyday essentials stylishly and comfortably in the Cheetah print baggallini Paris Bagg. This lightweight, water-resistant crinkle nylon bag features a roomy center compartment for your wallet, checkbook, cosmetics, and medications, and has its own ID/coin purse and key fob. A front zippered compartment has credit card slots, a lipstick holder, and zippered pockets for keeping valuables safe and secure. A back zippered compartment contains pockets for your cell phone and PDA, a pen holder, and another zippered pocket. Designed to carry your belongings securely, the baggallini Paris Bagg has an adjustable strap for your comfort.